This book commemorates the birth centenary of Dr Durga Das Basu, perhaps the most eminent Indian scholar of constitutional law in particular, and public law in general. It is a collection of scholarly lectures delivered at the Dr D D Basu Memorial Endowment Annual Lectures established in 2006 at the West Bengal National University of Juridical Sciences (NUJS),Kolkata, and the international conference on Constitutional Pluralism organized by NUJS as a part of the Dr D D Basu birth centenary celebrations in 2010. 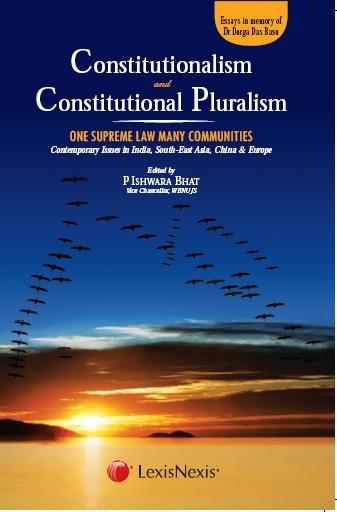 The essays in the book present the Asian and European experiences of the two great concepts that have influenced the contemporary world—Constitutionalism and Constitutional Pluralism. Constitutionalism believes in the supremacy of constitutional values, and the obligations on governments and other agencies to abide by them. Commitment to human rights, justice, goals of public welfare, good governance, democracy, multiculturalism, national unity and other values make a constitution worthy and supreme. These values are explored in the course of constitutional construction and enforced through complementarity in the functioning of governmental organs. Multiple communities put forward specific principles of governance;domestic legal systems also absorb international human rights principles; and constitutional ideas migrate from country to country. The diversity of constitutional sites arising from this phenomenon produces constitutional pluralism. The book contains in-depth insights that will inspire lawyers, judges, legal academics, students, researchers, policy makers and interested citizens who look for the latest in constitutional jurisprudence.